If you arrive by train, please get off at Oberammergau. Then continue with the bus 9622 to Schloss Linderhof (Linderhof Palace). Go from the motorway A95 and the federal highway B2 to Oberau. There follow the signs to the B23/Ettaler Straße direction Ettal. After Ettal, turn left on State Road ST2060. In Linderhof, turn right to the Castle. Parking spaces are available. From the train station in Oberammergau, take the bus number 9622 to Schloss Linderhof (Linderhof Palace). Linderhof Palace (Schloss Linderhof), in the upper Bavarian town of Ettal in southern Bavaria is a castle of the Bavarian King Ludwig II, which was completed in his lifetime. Linderhof Palace is the smallest of the three castles Ludwig II († 13. Juni 1886). Linderhof is considered the favourite Palace of the "Märchenkönig" (the fairy tale king), in which he spend most of his time. The castle is open to the public. The French Sun-King Louis XIV was an idol for Ludwig II. The construction of Linderhof Palace was inspired by the Palace of Versailles. There is a huge park as part of the castle. The entire park is equipped with numerous ornamentation. A small temple of Venus is located on the hill of the terraces, the hill behind the bedroom wing is decorated with a cascade and ends in the so-called Fountain of Neptune (Neptunbrunnen). Linderhof is one of the most beautiful examples of the mixed style of garden. The park combines elements of Italian Renaissance gardens or Baroque style with landscaped sections that are similar to the English garden. Enjoy the atmosphere and feel like a King. Linderhof Palace is like a look back in the history of the Bavarian. 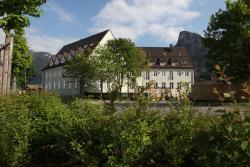 Monastery Ettal and Oberammergau are important tourist places nearby. Oberammergau is known above all by the ten-yearly passion play (Passionsspiele), as well as local artisans ("Herrgottschnitzer") and the houses decorated with "Lüftlmalerei". From Garmisch-Partenkirchen (about 25 km away), you can reach Germany's highest mountain: the "Zugspitze" (2,962 m). Enjoy the great view over the Alps. 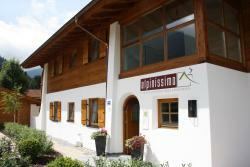 This 5-star Alpine-style hotel is located in the centre of Oberammergau, 700 metres from the Passion Theatre. 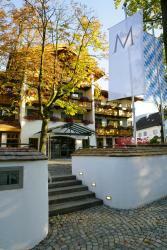 Hotel Maximilian offers design rooms, an award-winning restaurant and a spa area. Peacefully located in Oberammergau’s scenic residential area, this apartment features a fully equipped kitchenette, balcony and terrace, and an outdoor bathing pool with panoramic views of the Ammergau Alps. The 4-star Alte Postvilla resort offers stylish apartments, and free sauna and gym access. Guests have their own kitchen with a dishwasher, and a living area with flat-screen TV and DVD player.